This is my husband’s go to meal to use up whatever we have in the fridge. Well we were out of rice too so he subbed quinoa instead this time. It came out so good! I actually liked it better with the quinoa. This is a great dish for vegans because quinoa is a complete plant based protein. We added tofu to ours. If you want to make the tofu, just cut it into cubes and bake it at 400 for about 30 minutes. Or you could add your favorite protein and you have a great little meal. This is a super easy meal to whip up quickly. We almost always have a container with cooked rice or quinoa on hand to make meals last longer so the quinoa had been cooked ahead of time. If you have never cooked quinoa, it is a 2:1 ratio. I part quinoa to 2 parts water. Bring to a boil and then cover, turn down and simmer for about 10-15 minutes or until the liquid is absorbed. In a sauce pan , saute veggies for 5-7 minutes in toasted sesame oil, soy sauce, mirin, salt and garlic. Then add the quinoa and saute for another 6-7 minutes. The veggies should still retain some crunch. Enjoy! Great idea using quinoa instead of rice. It's way more nutritious, I'll have to remember this. I liked it even better that way. oh my, this looks delish. What is the Aminos you mentioned? I want to try it without the soy sauce! thanks! Thanks! Bragg's Aminos. You can get it at most grocery stores. It might be near the soy sauce or near the oils and vinegars. 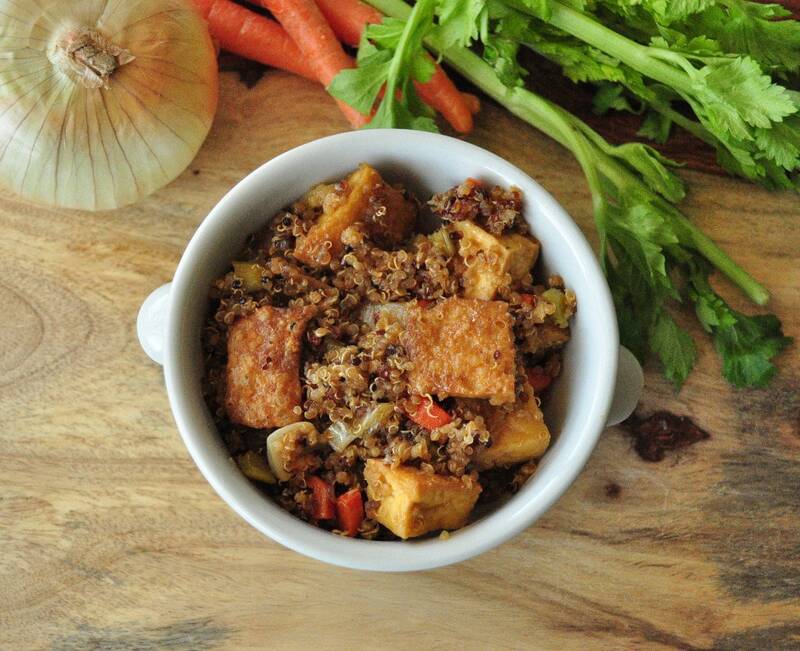 Is that tofu in this quinoa stir fry? I'm wondering what those tan-ish blocks are. This is fabulous! A new staple around our house!! I thought the recipe looked good, but it looked good with Tofu in it yet the tofu was not mentioned in the recipe. I like tofu when I have it in restaurants but have never cooked with it, so it would be nice to provide people like me with the whole recipe including what type of tofu was used and how it was cooked before adding it into the other ingredients. I do thank you for posting it. I didn't put the tofu in the recipe, because it is optional. Not all people like it. If you want to add tofu, it's super easy to do so. Just buy extra firm. Cut into cubes and place on a greased baking pan. Add a bit of salt and garlic powder and bake at 400 for about 30-45 minutes. I just tossed the tofu in after the recipe was made. I bought the pre-diced tofu and I think the cube were too small so dried out badly after baking for 40 minutes. Next time I'll dice them myself larger. Yes, we have bought those on accident once and they are so tiny. We always buy the block and cut it ourselves. The cubes are much bigger that way. I almost felt cheated with the diced one. It was way less. This sounds good! Do you have any other recipes for quinoa? I just bought my first bag today and was wondering what else I can make with it. Thanks! Thank you! I have a cookie recipe that calls for quinoa. https://mywholefoodlife.com/2012/12/03/quinoa-pine-nut-and-chocolate-chip-cookies/ You can also sub quinoa for rice in any rice recipes you come across. This is fabulous! I added fresh shredded ginger and bell pepper slices! Delish! Pingback: Quinoa met groenten en tofu | Wat eet je dan wel?